Earthworm Watch is a collaboration between Earthwatch, The Natural History Museum and the Earthworm Society of Britain. The Earthworm Society (ESB) is a voluntary organization that plays an important part in supporting scientific research to improve the conservation of earthworms and their habitats and educates and inspires people to take action to help earthworms. The ESB runs the National Earthworm Recording Scheme and training courses for those who are keen to identify and record earthworms. Kieron Derek Brown is the Recording Officer for ESB and he is extraordinarily passionate about his work and his enthusiasm for earthworms is infectious. 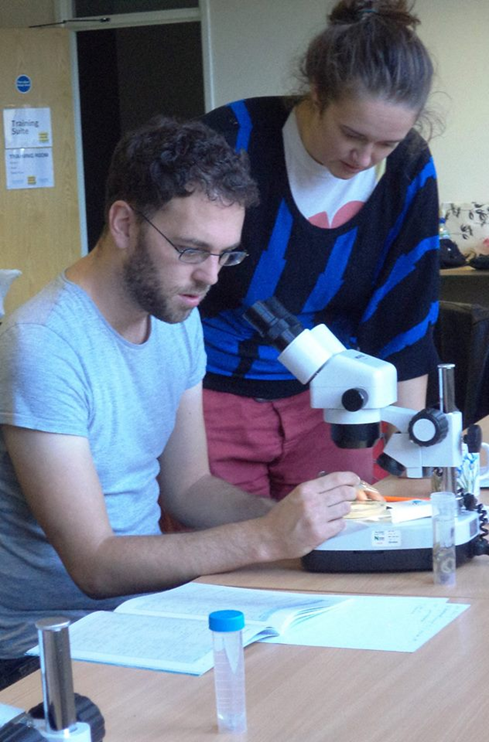 Keiron runs identification courses and helps to train new earthworm recorders. He also champions the National Earthworm Recording Scheme along with promoting Earthworm Watch. Together, Earthworm Watch and the National Earthworm Recording Scheme are helping scientists better understand the distribution and abundance of earthworms in the UK and Ireland. In his own words, Keiron explains how he ended up studying, promoting and conserving earthworms. What got you into a career in science in the first place and how did this lead to your current role? I’ve always been fascinated by science, particularly the way in which living organisms have shaped our planet and the complex ways in which different species interact. This led me to study Biology at the University of Newcastle upon Tyne. Following University I have volunteered and worked for a number of conservation and research organisations in the UK, Borneo and Australia covering invertebrates, bats, snakes and fish. I now work for the Field Studies Council (an environmental education charity) as the project development officer on the BioLinks project, which aims to deliver training to volunteers on a number of difficult-to-identify invertebrate species groups. I combined my passions for earthworms and biological recording when I joined the Earthworm Society of Britain as a committee member in 2012, and I am now the Recording Officer for the society and lead on delivering training for new earthworm recorders, supporting and mentoring our existing recorders, producing the society’s guidance on earthworm sampling and recording and managing the National Earthworm Recording scheme data. This also includes making sure our earthworm species data is shared with other organisations where possible to ensure it is readily available to decision makers and researchers. How did you become interested in studying Earthworms? I became interested in earthworms through volunteering for the Soil Biodiversity Research Group at the Natural History Museum. We undertook sampling of soil invertebrates in woodland habitats in the UK and Borneo. This research lead me to realise the huge role that earthworms play in soil and deadwood habitats, and that different species of earthworm are responsible for different stages of decomposition of organic material. What interests you about earthworms and the project Earthworm Watch? The UK has a long history of recording wildlife, yet earthworms are still hugely under-recorded. My particular interest in earthworms stems from the fact that we still know relatively little about their UK distributions and earthworm ecology is therefore still a frontier science! Why do you think the science of Earthworm Watch is important? Earthworm Watch is contributing towards that frontier science by asking questions regarding how earthworm populations tie in with carbon storage in different urban habitats. Furthermore, the survey has been designed in a way that enables anyone with an interest in nature to get involved and contribute to this meaningful study. If you haven’t had a chance to do Earthworm Watch yet to find out the earthworms in your area, please sign up. If you’d like to find out more about The Earthworm Society of Britain, would like to join or become an earthworm recorder to deepen your knowledge, please visit their website. You can also read the Earthworm Society’s latest National Earthworm Recording Scheme Annual Report which explains their activities, events and records made in 2016.